There are currently three, loosely compatible, standard rail systems that you will find on firearms, airsoft guns, and paintball markers. All three of them are closely related to each other. In this article we are going to explain the differences between Weaver, Picatinny, and NATO rails in a number of ways--layman term, practical examples, and specifications--to help you take advantage of the rail interface system (RIS). If you have a question that's not covered in this article, ask us in our forums. Slot - On the rail, there are rectangular cuts (see photo below). They are called slots. The slots allow screws to run through them, which helps aligning accessories on the rails. For this section, you can assume that Picatinny rail and NATO Accessory Rail are practically the same. In this section, we use "Picatinny rail" to refer to both Picatinny and NATO rails. Read about their minor differences in the "Specification Differences" section . The following photo shows a Weaver rail (top) and a Picatinny rail (bottom). They both serve the same purpose, but have subtle differences. Both rails have the same width with the same angled features along the side edges. The slot width is consistent per rail type, however, Picatinny slot width differs from Weaver slot width. On the Picatinny rail, the slot distance from one another is consistent. But on the Weaver rail, the slot distance may vary. In fact, a Weaver rail may have any number of slots. 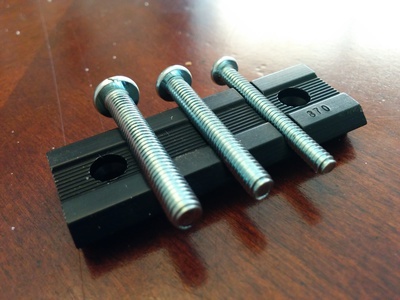 The following photo shows three difference size screws in the Weaver rail slots. The screw size are #10, #8, #6. Only the #6 screw fits the Weaver rail slot. The other two are too big. On the other hand, all three screws fits the Picatinny rail slots, even though the #10 is slightly pushing the limit. The photo below shows the #10 screw leaving marks on the Picatinny rail. The #10 is just slightly too big, even though it works fine with the Picatinny rails. When you look at the cross section of the Weaver rail and the Picatinny rail (see left photo below), you'll see that the Weaver rail has a lower profile. The Picatinny rail is slightly raised, like a mushroom on its stalk. Right photo below shows bottom of two Weaver rails (left and center) and the bottom of a Picatinny rail (right). There are some Picatinny-Weaver hybrid rails out there. The following photo shows one such hybrid. The top rail is a Weaver rail. The middle rail is the hybrid. The bottom rail is a Picatinny rail. The hybrid's slot width is the same as the Picatinny slot width. But the slot distance vary, like a Weaver rail. For this particular hybrid, it should be considered as a "Weaver" rail. The following photo shows a Picatinny rail (top) and a scope ring with rail (bottom). The rail on top of the scope is a hybrid. The slot width are the same as a Picatinny rail slot. The slot distance is consistent. But the slot distance differs from Picatinny specs. This hybrid should also be considered as a "Weaver" rail. Locking screw is #6 or smaller. There is, at most, one locking screw. The mount bracket is not thick enough at the bottom to require the taller Picatinny specification. There is another variation to the Picatinny rails and Weaver rails. That is there may be a perpendicular wide slot all the way down the rail as shown in the photo below. The following photos makes the difference very clear. The Picatinny rail on the left does not have this perpendicular slot. The Picatinny rail on the right does have the perpendicular slot. There is no real practical use for this perpendicular slot. But it doesn't get in the way of using a Picatinny or a Weaver rail. That slot is likely for reduction in material cost during manufacturing. Traditionally, all three rails are made out of metal. Metal rails are extremely robust and reliable. However, its weight penalty causes burden on speed and operator fatigue. Today, there are rails that are made out of plastic, usually nylon polymer. The nylon polymer rails provides excellent compromise between durability and weight. As seen in the photo below, steel metal rail could weight six to seven times as much as plastic rails. Metal rails should be used when it's mounted close to high-heat areas. And foregrips should be mounted to metal rails, due to the leverage it could exert. But if heat is not an issue, nylon polymer rails are generally sufficient for most accessories. They are excellent substitute for weight reduction. The Weaver rail has a width of 21.2mm. The Weaver rail may have slots. The slot have a fixed width of 0.180" (4.57mm). Other than that, the dimension of the Weaver rail is rather loose. Picatinny rails are specified using MIL-STD-1913, and is later rectified as STANAG 2324, shown below. Note that almost every dimension is specified for this rail. All of the dimensions are specified in inches. NATO Accessory Rail is specified using STANAG 4694, shown below. The specification is basically the same as the Picatinny rails. The biggest difference is the dimensions are specified in metrics system, rather than English system. Only other difference is that the NATO Accessory Rail allows a rounded base. 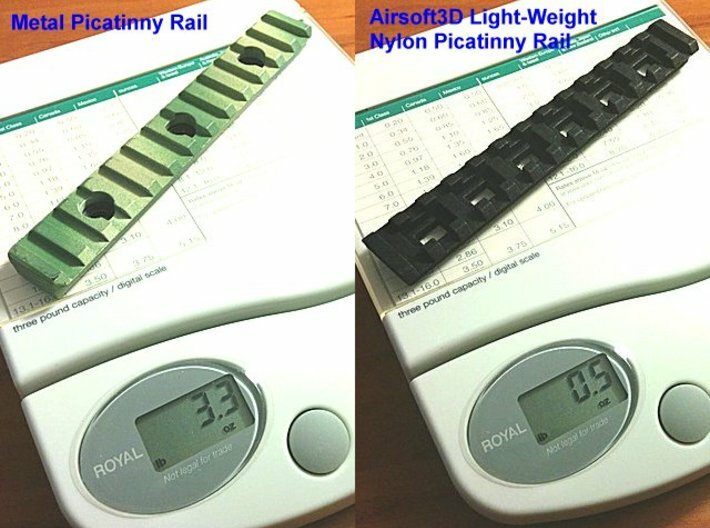 One addition specification difference between the Picatinny rail and the NATO Accessory Rail is at the Rail/Grabber Interface (see difference below). This difference is significant at the mechanical design level, not at the consumer level.